*** ADDITIONALLY... IRC is NOT your own personal direct line to the staff and admin team. ALL player/server concerns, whitelist request, ban appeals, ideas, notions or opinions need to be communicated over the forum or in game. IRC is not the place. Thank you for understanding. As many of you have noticed we've decided to change the way we handle giving voice on IRC. 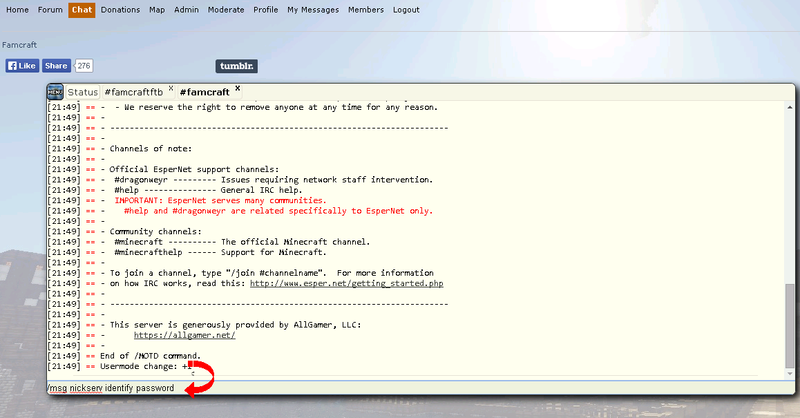 "Voice" on IRC means your ability to speak in the public #Famcraft IRC channel. In the past, it was simple. 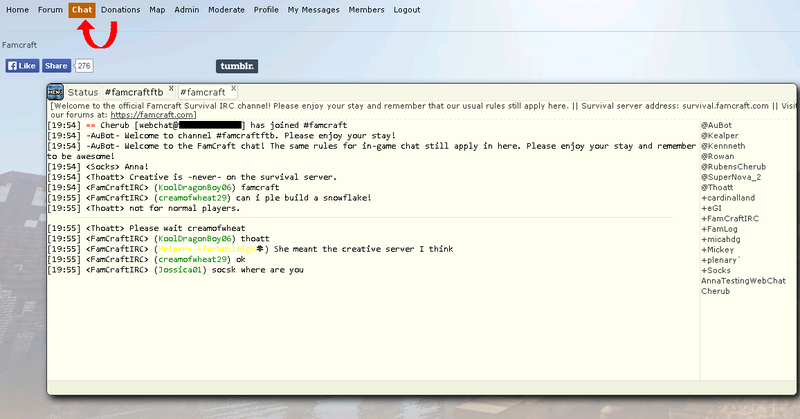 You'd join #Famcraft IRC, and just start chatting away, no questions asked. This is because you are a Famcrafter, and Famcrafters ROCK! Sadly, not everyone is a Famcrafter Some people are just very bored meanypants. Last week, a group of very bored potty-mouthed NON-Famcrafters hopped right into our IRC channel, and said many rude and otherwise inappropriate things. Obviously, we do not want to ever see anything like this happen again. We've made some changes to help better protect our community. As a result of these changes, currently when you join #Famcraft IRC, you have to wait for a staff member to notice you've joined and then they will grant you voice. (The ability to speak on IRC) This is not ideal for players OR staff. We know some players have been very unhappy with these changes, but keep in mind it's not much fun for staff to have the extra job of watching for players to join irc so they can grant them voice either. Staff stays busy enough! lol. We want to offer an option that may be helpful for some of you. 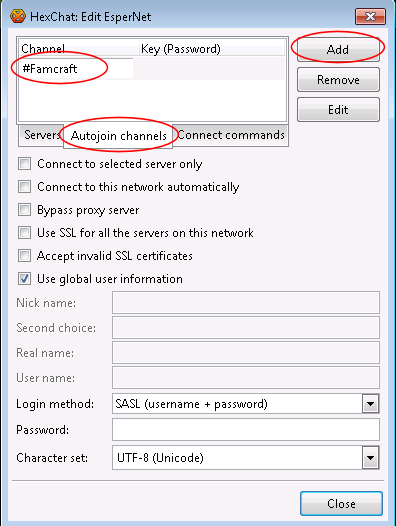 This option will allow you to join #Famcraft IRC, and be voiced automatically upon joining. However- This option DOES take some effort on YOUR PART. In order to be auto-voiced when you join IRC, you will need to register your IRC nick name. We CAN NOT help you with this beyond providing these instructions here. We do not own or operate the IRC network as a whole. 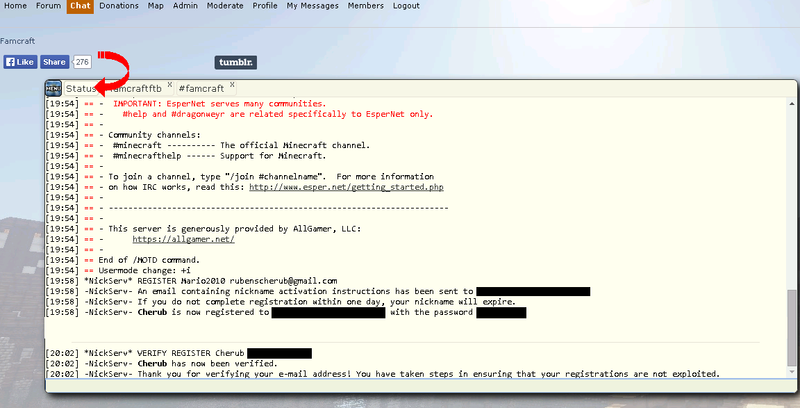 We just have the #Famcraft IRC channels. There is ABSOLUTELY nothing we can do to help you register your nick name. However, if you follow the steps provided below, you should be able to register your nick name easily. If you have trouble with it, contact an adult you trust IRL, such as a parent, guardian or other relative and ask them to help you. Registering your nick name has the additional benefit of protecting your name so no one else can register it and use it. Please note, you will lose your registration if you do not log in at least one time every 30 days. NO MATTER WHAT, Please DO NOT post the info you use to register on this thread. Post your registed nick name and ONLY the nick name. DO NOT post the email address OR the password you used in this forum, and do not share that information with anyone else. This is very important. Always keep your passwords private and safe. 1.) 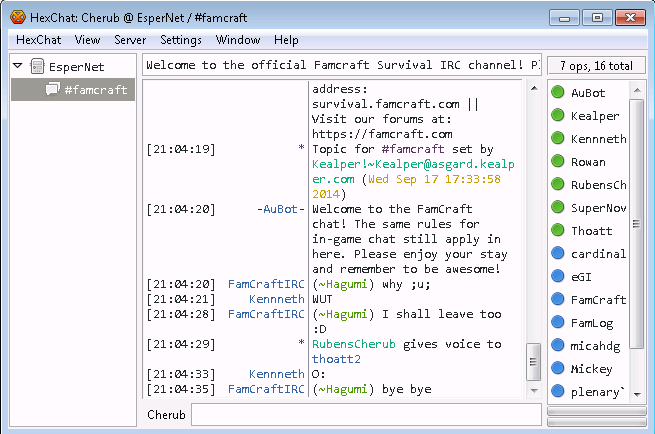 Join IRC via the webchat here: https://famcraft.com/index.php?action=chat , or your favorite IRC client using the name you would like to register. Some names will already be registered, so be sure to have an alternative in mind. Remember, your IRC name needs to be similar enough to your in game name that we will know who you are. 2.) Select the "Status" Tab up top on webchat, OR look for the Status Window in your IRC client. 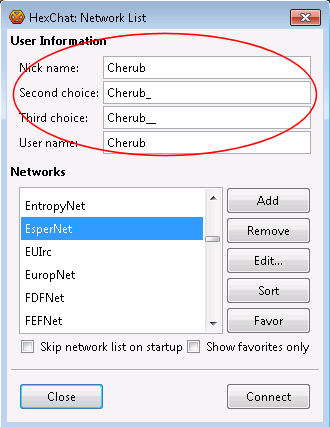 The "Status" window may be named "EsperNet" This is an important step. It can keep you from accidentally sending your password and email address into public chat. 4.) Check your email for a message from "EsperNet Account Registration"
Thank you for registering your account on the EsperNet IRC network! 5.) Hightlight, right-click and copy the line of text that says "/msg NickServ VERIFY REGISTER YourName weirdlineoftext", make sure you do not copy any white space before the text. So copy only exactly that one line of text. 6.) Paste that one line of text you just copied- "/msg NickServ VERIFY REGISTER YourName weirdlineoftext" into the "Staus" window. [20:02] -NickServ- YourName has now been verified. [20:02] -NickServ- Thank you for verifying your e-mail address! You have taken steps in ensuring that your registrations are not exploited. 9.) Post your registered nick name here so we can get you set up to receive voice automatically. Until we set it up for you, it will not work. Letting us know you are registered is the final step. Again, ONLY post your nick name here. DO NOT post the email or password you used. 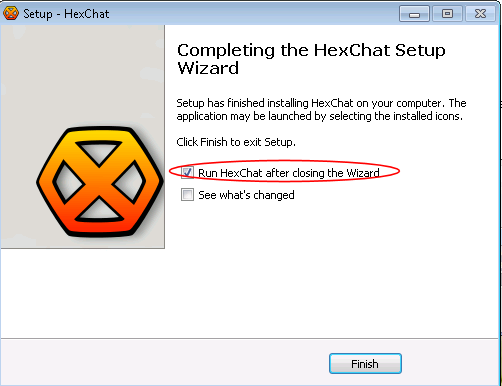 If you would like to use a safe, FREE IRC client that has the ability to log you into irc automatically each time you join instead of using the Famcraft webchat, we recommend a client called HexChat. 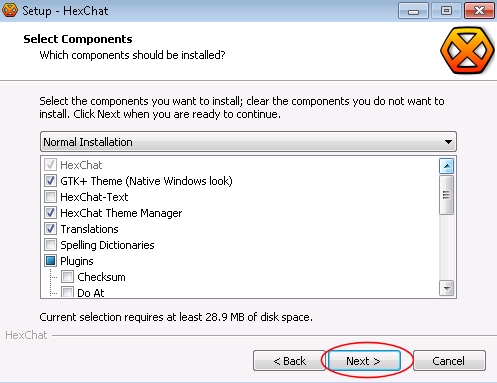 * If you have a 64 bit Windows OS, please download the version labeled: HexChat 2.10.2 "x64"
* If you have a 32 bit Windows OS , please download the version labeled HexChat 2.10.2 "x86"
* If you have Windows, but are unsure if your OS is 64bit or 32bit, then please download the version labeled HexChat 2.10.2 "x86"
*If you have a Linux or Mac OS, please download the appropriate version of the software for your system. 1.) 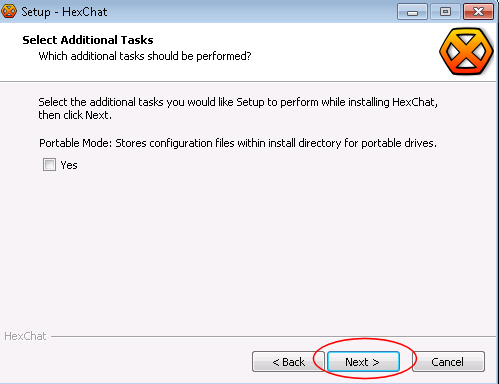 Download the version of the HexChat client you need for your system. Make sure you save it to a place you can find easily. 2.) 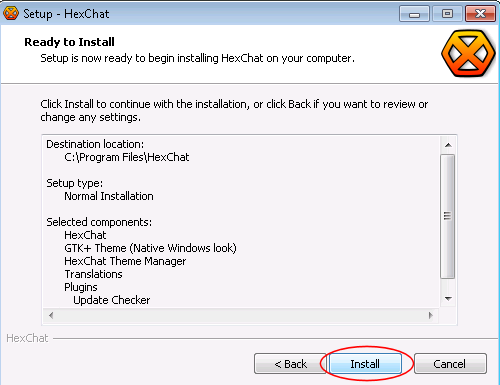 Double click the HexChat.exe to run the installer. If you see a security warning, you are safe to click "Run" as long as you downloaded the program from the link provided in this tutorial. 3.) 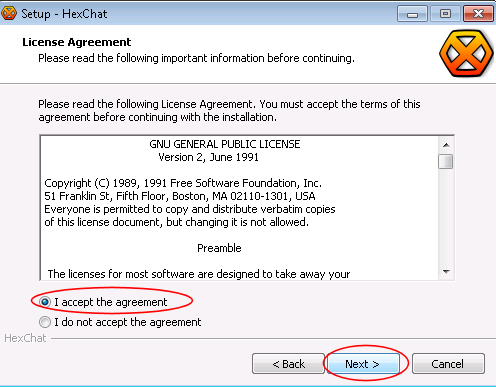 Click next, then read over and accept the License Agreement by selecting the dot next to "I accept the agreement"
4.) Click next to proceed. 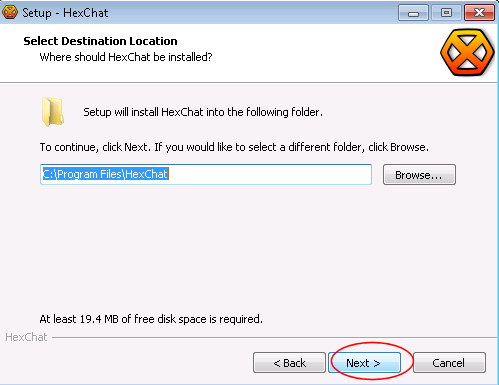 Allow the program to install to the default location, normally C:\Program Files\HexChat on windows machines. 5.) Click next. Under "Select Components" leave the boxes that are checked by default checked. 6.) Click next. There is no need to change anything under "Select Additional Tasks". 7.) Click next to proceed. On the "Ready to Install" page click "Install". 8.) Once the program is installed, you can launch the client. 9.) You may see a security warning the first time you launch the program. This is ok. you can safely allow it to run. You should also allow access through the firewall if you receive any firewall related questions. 10.) 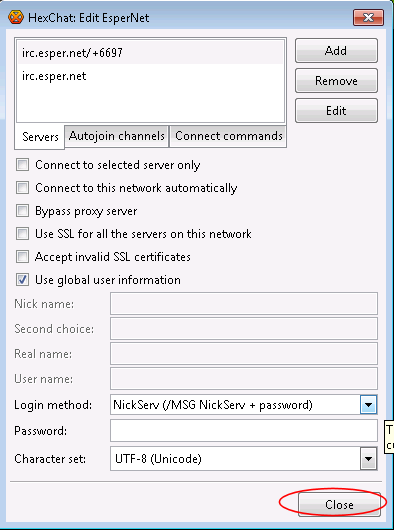 In the "HexChat Network List" Window, under "User Information" Enter your IRC username, as well as a second, and third choice for your nick. Ideally the additional choices will be the same as your nick with an _ added to each one. This can help avoid confusion over names. 11.) 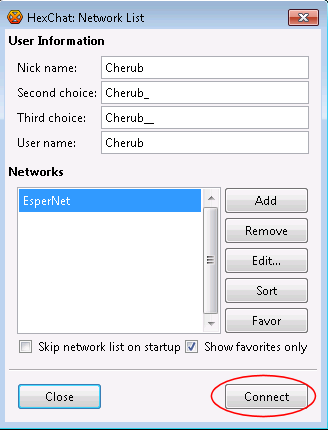 Under the "Networks" section, select "Espernet". 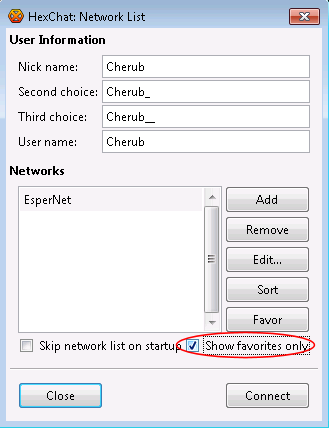 If you like, you can click "Favor" and check the button "show favorites only" so you do not display all the un-needed servers in that list. 12.) 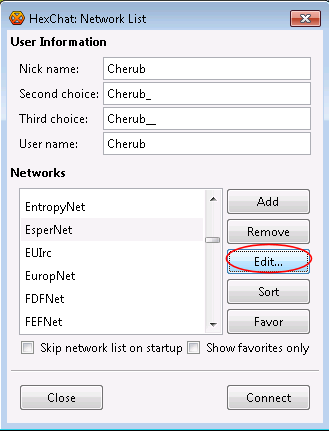 Click the "Edit" button next to the "Networks" list. 13.) 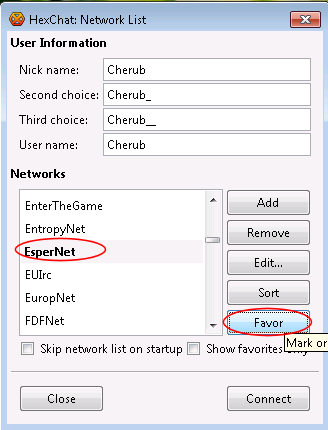 In the "HexChat: Edit EsperNet" window click "Autojoin channels". 14.) 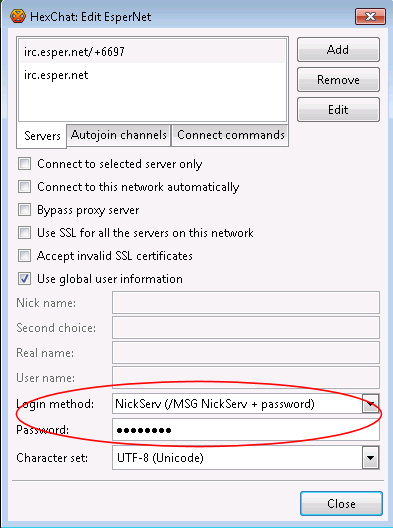 If you've registered your nick name, under "Login Method" select "NickServ (/MSG NickServ + password)"
-enter your IRC password next to "Password", and then your client will automatically log you in when you join IRC. 15.) Click the "close" button to return to the HexChat homescreen. 16.) 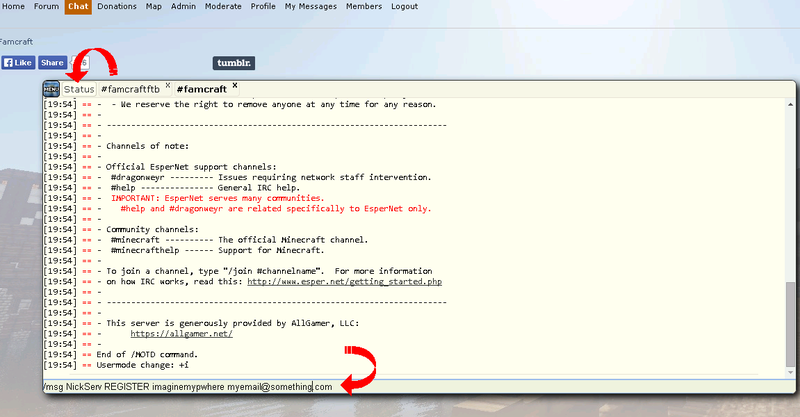 Make sure "EsperNet" is highlighted and click "Connect" to connect to IRC and join the #Famcraft IRC channel and chat away. 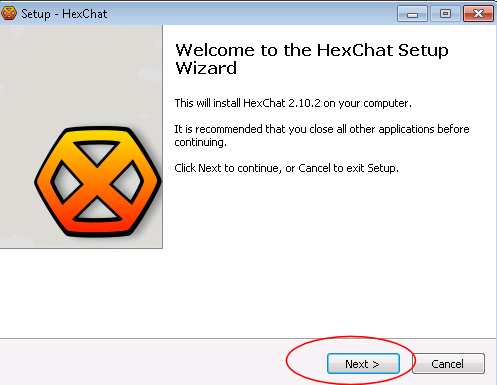 * Next time you start the HexChat client, you will need to do so from your program menu. To keep track, and keep this thread clean: I will keep an alphabetical list of players here that have already been set up for auto-voice. If your name is NOT registered/verified, and you post your name here, I will remove the post, and NOT add your name to the list. Please try again, and post here when you have correctly registered and verified your nickname. If you do NOT log into your name in 30 days, it is unregistered. This is not our doing, but espernet. We have no control over this. You WILL lose auto-voice if your name gets un-registered, and you WILL have to re-register your name with espernet following these instructions again. Voice on IRC is a privilege, not a right. You can be upset all you want, but posting here does not guarantee you instant voice. The name FrumpyTrout is not currently registered. Just posting for auto voice (Zerop). No hurry - I know there are more pressing matters.